SparkFun has been doing its thing for about sixteen years now. Impressive, right? I've been here for a whole nine years of it and I often feel like some sort of ancient sage (maybe more ancient than sage, but let's not go there). The point is, I recently learned that one of our suppliers is celebrating its ONE HUNDREDTH birthday. Now there's a number. Consolidated Electronic Wire and Cable has been in business since 1919! You may already have one of their handy Hook-up Wire Assortment dispenser boxes on your workbench, or some spools of their stranded or solid-core wire rigged up on a rod, hanging from a wall peg, or simply floating about your desk drawer. They also supply us with a nifty Magnet Wire Kit if electromagnetism is your bag. 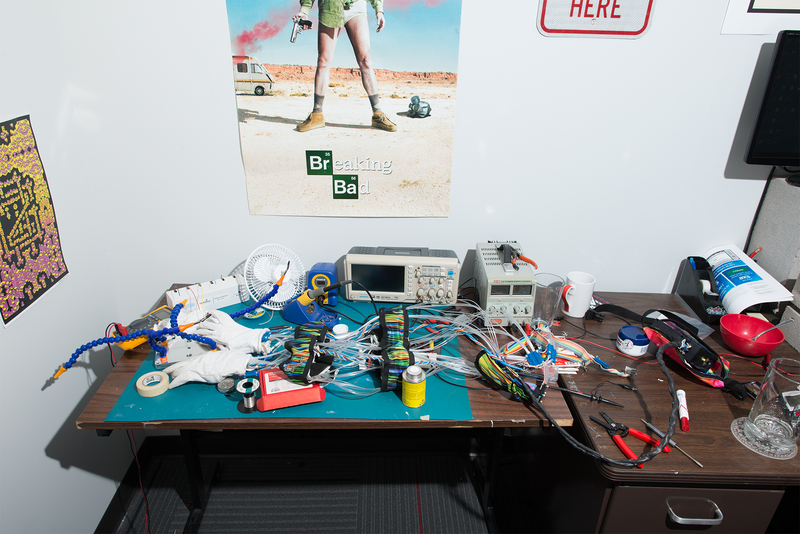 See if you can spot the Hook-up Wire Assortment from Andrew's "Desk of an Engineer" post. Next time you find yourself working with any of this ubiquitous wire, take a moment to appreciate the century of glorious American manufacturing that has led up to the present day, and the simple, yet critical object in your hand. I mean, really take it all in. Unfurl a whole rainbow of wire from that dispenser box, wrap it around your torso like a cummerbund, drape it over your shoulder like a sash -- whatever it takes to get you fully immersed in the experience. Embrace that sheer polyvinyl chloride as you reflect upon the bond we thoroughly modern humans share with insulated strands of copper. 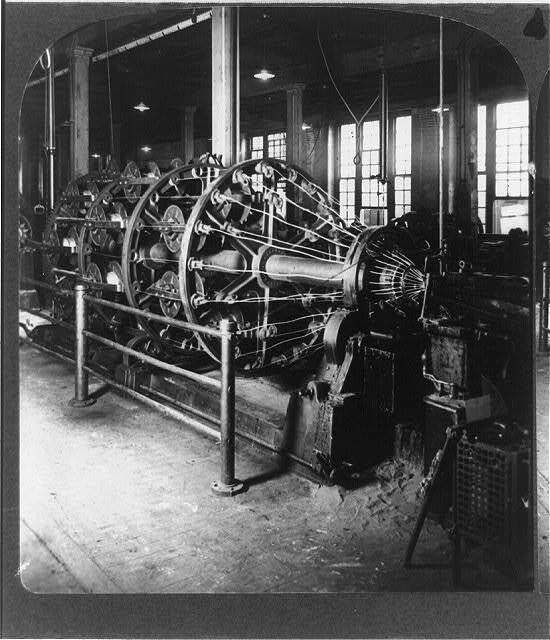 From the era of telegraphy to the Space Age, Consolidated Wire has been cranking out solutions to help the world connect point A to point B.
Wire-twisting machinery from the 1910s. A little historical context: in 1919, when Consolidated Wire got their start, the vast majority of American households still lacked electricity. The First World War had only just ended, Prohibition just begun, and women did not yet have voting rights in the US. Two-handed candlestick telephones were en vogue, commercial radio was but a nascent dream, and films were all silent. Seriously, when Consolidated's ship set sail, Babe Ruth was still playing for the Boston Red Sox and Billy Murray made the Top 20 with a 78 RPM shellac pressing of a song called, "And He'd Say, 'Oo-La-La! Wee-Wee!'" Only 1910s kids will understand. Lo, Consolidated Wire and Associated Corporations was born in Chicago, IL, as a successor to the Mann Electric Company, and cut their teeth manufacturing and selling wire, cable and radio accessories. During World War II, the company provided wire and cable for military communication, and in the post-war era, it expanded into the burgeoning consumer electronics realm, producing parts for radios, televisions and various household appliances. Today's Consolidated Electronic Wire & Cable is an 80 percent employee-owned (ESOP) company serving a wide array of markets. They manufacture our stranded and solid core hook-up wire varieties, including the aforementioned assortment packs in their lovely, custom-sourced dispenser boxes, as well as our magnet wire. It's all proudly made right here in the U.S. of A. In addition to their vast catalog of wire and cable, Consolidated Wire also keeps up a great blog with informative posts like (my personal favorite), The Ultimate Guide to USB Cables, which concisely lays out the various USB options with their basic specs and advantages. What unconventional uses have you all found for our Consolidated Wire products? What were you up to back in 1919? I know some of you have stories. Please feel free to hit us up in the comments with your wire-related musings and anecdotes. The space age? That was half a century ago. The space age is from 1957 to present. The information age is from 1970 to present. Technically we are in the atomic/nuclear, information/digital revolution, & space age.